The Orla top has fairly slim-fitting set-in sleeves, with a smooth sleeve head and subtle pleat at the shoulder. The pattern includes options for both full length or cropped-above-the-elbow sleeves, so the pattern will see you through all year round. You should have two symmetrical sleeve pieces – the front is marked with a single notch, the back with a double notch. 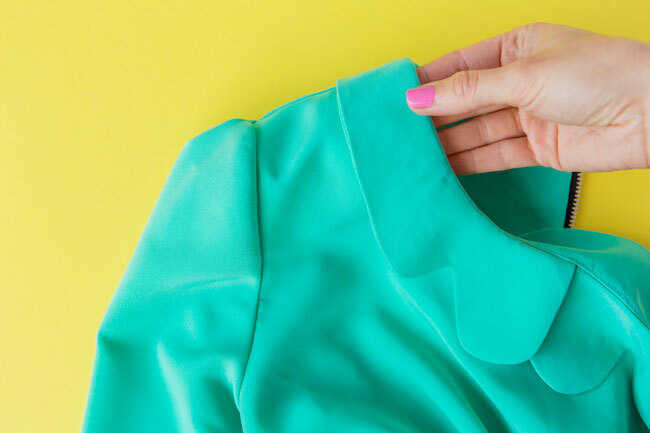 If your fabric looks the same on both sides, make sure you’ve got one left sleeve and one right sleeve both facing up before you start. They should both have pleat markings on them exactly 15mm (5/8in) long – check the pattern if you’re unsure. At the top of each sleeve, fold the fabric right sides together, bringing the pleat lines directly on top of each other, and pin in place. 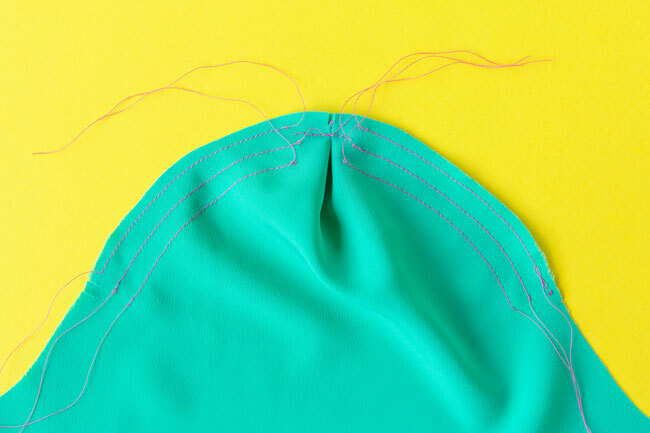 Sew each pair of pleat lines together with a line of stitching exactly 15mm (5/8in) long. 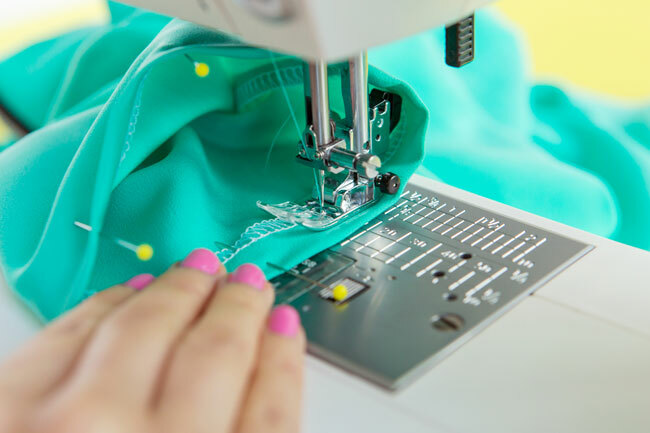 It’s best to start sewing from the inside of the pleat marking, sewing out towards the raw edge – if you start at the raw edge, you may find your threads get knotted up into a bit of a mess. Back tack at the start of the stitching, and the end if you can, so the stitching stays in place. Spread each pleat open and finger press it flat against the sleeve so it’s spread evenly each side of the stitching. Pin each pleat in place. Set your machine to a longer stitch length (about 4mm) and tack (baste) horizontally across each pleat, 10mm (3/8in) from the raw edge. 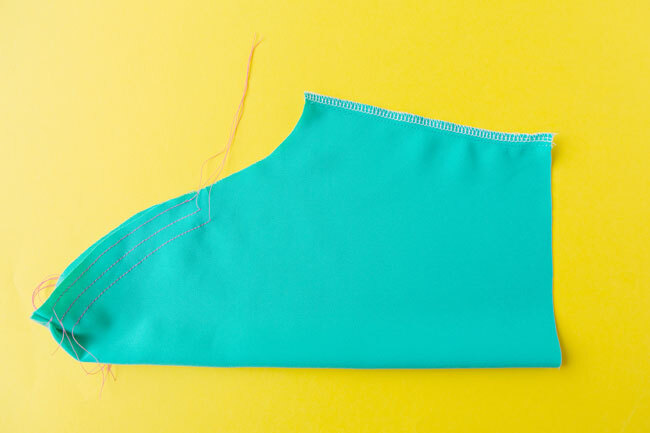 You could also call this tacking “stay stitching” as what you’re doing is holding the pleat in place so it stays put when you sew the sleeve into the armhole. The sleeve in the left of the photo above is showing what the pleat should look like on the right side (outside) of the fabric; the sleeve on the right is showing the wrong side of the fabric. 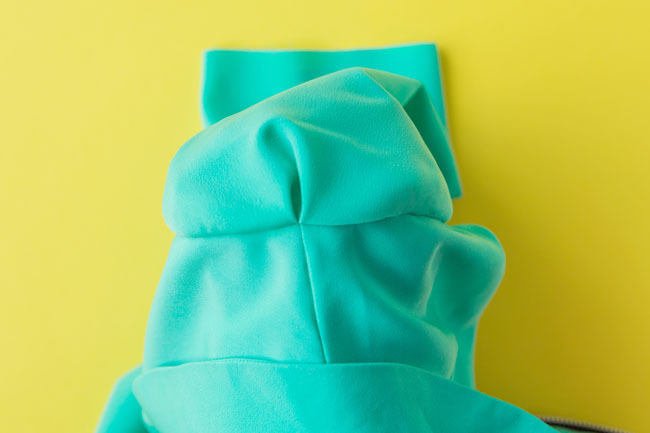 The sleeve head is a bit bigger than the armhole in order to create enough space for the fabric to go over the curve of your shoulder. So we need to ease the longer sleeve seam into the smaller armhole seam – and we’re going to use “ease stitching” to do it. 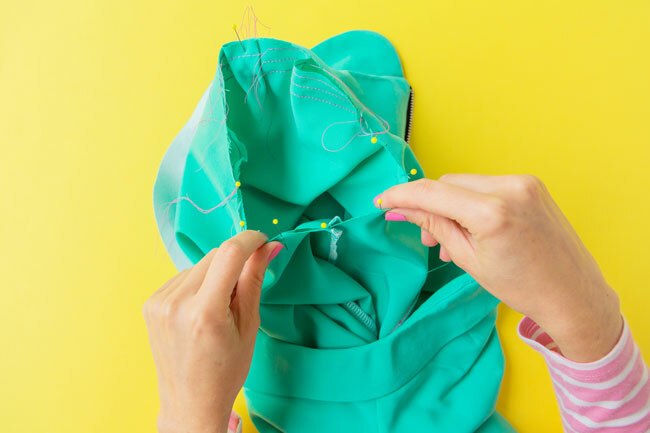 This is pretty much the same thing as “gather stitching” if you’ve sewn a gathered sleeve head before, but more subtle, as ideally we don’t want to see the gathers on the outside of this sleeve. Thread your machine in a contrast colour, so it’s easy to see the stitches and pull them out later, and set it to a longer stitch length. Starting about 5mm (1/4in) from the top of the sleeve, sew a row of stitching parallel to the raw edge, from one sleeve notch to just before the pleat, leaving some loose thread at either end of the stitching. Do the same thing on the other side of the pleat, from just after the pleat to the other sleeve notch. 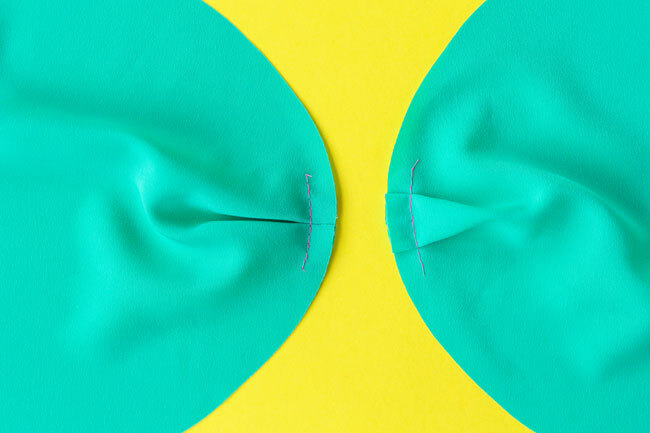 On each side of the pleat, sew two more rows parallel to the first, about 7mm (1/4in) apart – you should end up with two sets of three rows of stitching. Do the same on the other sleeve. 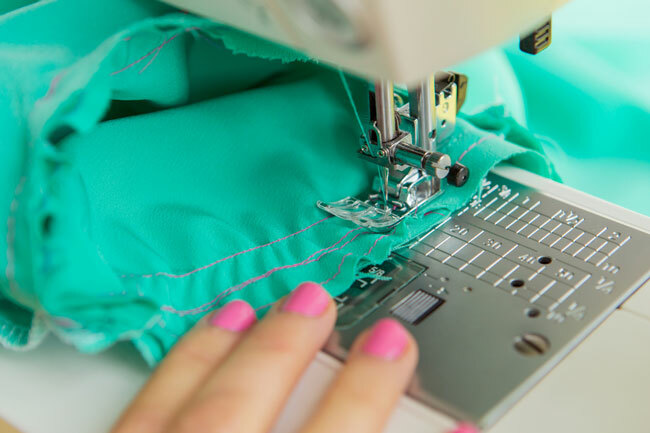 Rethread your sewing machine in a matching colour and reset the stitch length to 2-2.5mm. 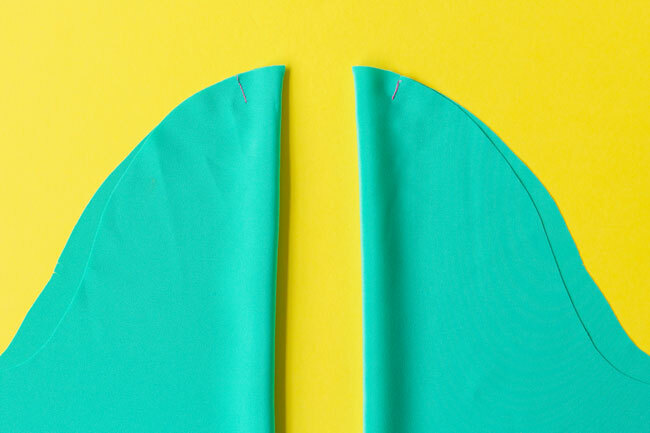 Fold each sleeve lengthways, right sides together, and pin together the underarm seams. You might want to try the sleeve on your arm now and take it in or out if you prefer a slimmer or tighter fit. Try to avoid changing the position of the seam at the top too much as it’ll affect the way the sleeve goes into the armhole. Stitch. Trim the seam allowances, finish them with zigzag stitch and press them either open or towards the back (remember the back has double notches on the sleeve head). Before pinning the sleeves to the armhole, check you’re putting the left sleeve into the left armhole and the right sleeve into the right armhole. I like to start by laying the bodice out right sides out and putting each sleeve next to its armhole – remember the front of the sleeve head has single notches, the back has double notches. 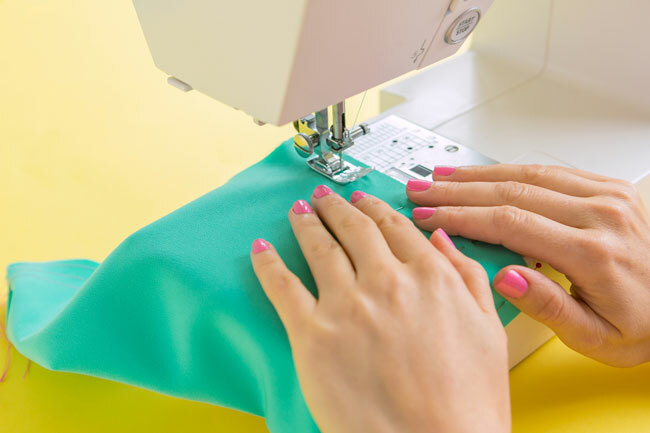 Grab hold of the three ends of ease stitching on one side of the pleat – just three threads on the inside of the sleeve, not all six otherwise they won’t move – and gently pull on the ease stitching to gather up the fabric slightly. Do this until this part of the sleeve between the pins fits the armhole, then smooth out the gathers with your fingers so they’re nice and even, and secure in place with plenty of pins. Do the same on the other side of the pleat. We’re going to tack (baste) the sleeve into the armhole before sewing it for real. This is by no means essential, I often cut straight to the stitching, but if you haven’t set in many sleeves before – or just want to make extra sure you get it really neat - it’s good to have a practice run with some temporary stitches that we'll pull out later. Thread your machine in a contrast colour and set your machine to a longer stitch length. 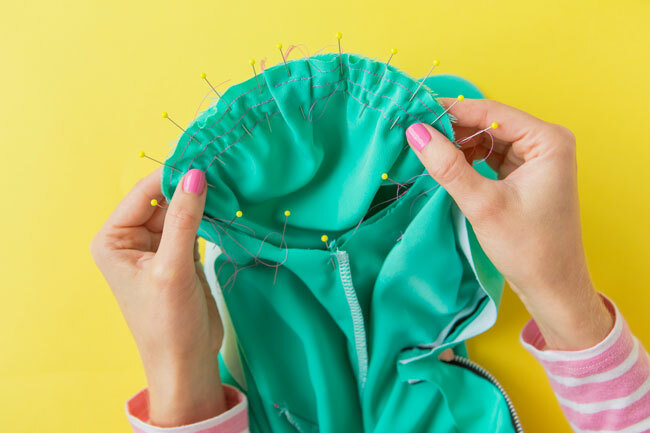 With the sleeve right sides out, the wrong side up on your sewing machine so you’re sewing within the loop, tack (baste) the sleeve into the armhole using a 10mm (3/8in) seam allowance. 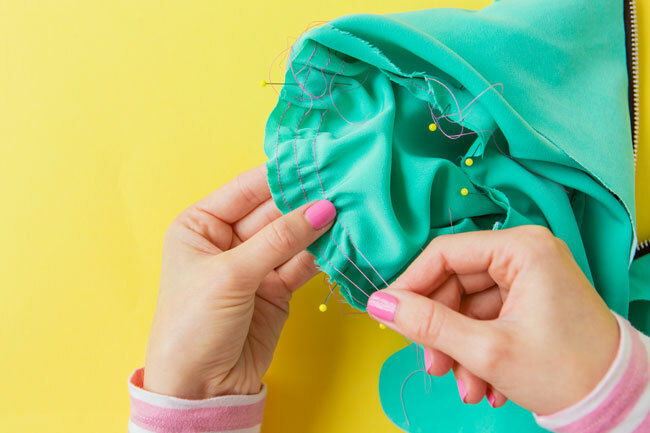 Sewing the sleeve this way means that you can keep an eye on the little gathers of fabric – take your time, pausing with the needle down when you need to, and use your fingers to smooth out the easing in the fabric so it stays evenly distributed. Once you’ve tacked the sleeve in, take a look at the right side. The aim is to end up without any little pleats or puckers, just a subtle fullness at the shoulder. If you’re not happy with how it’s gone in, you can unpick some of the tacking around any folds of fabric, smooth them out and try again. On the other hand, if you just want to finish the top and get on with your life, I hear you! Once you’re happy, rethread your machine in a matching colour thread, reset the stitch length to 2-2.5mm and sew it in for real with a 15mm (5/8in) seam allowance. There’s no need to back tack as long as, when you come full circle, your final few stitches overlap the first few. 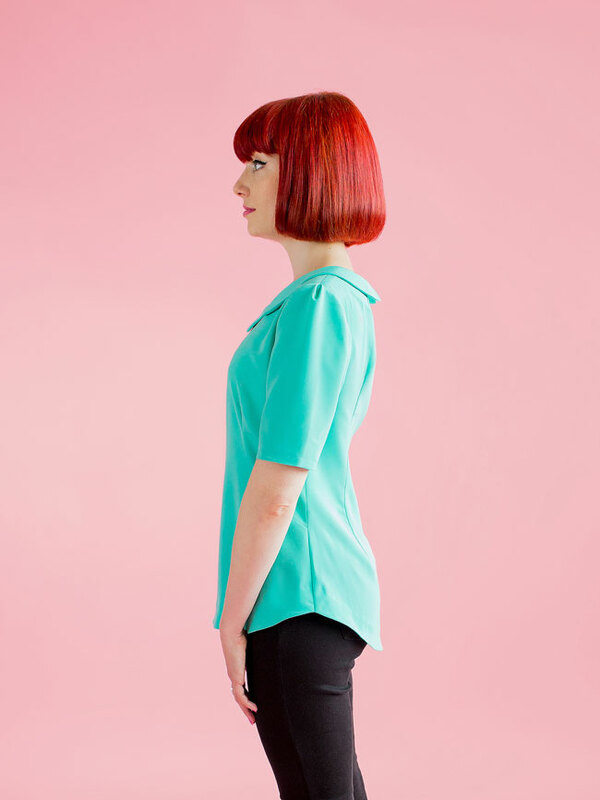 The Orla top includes a 20mm (3/4in) sleeve hem allowance. Try the top on and shorten the sleeve length if you need to, bearing in mind that it will end up being 200mm (3/4in) shorter than where the raw edge finishes. 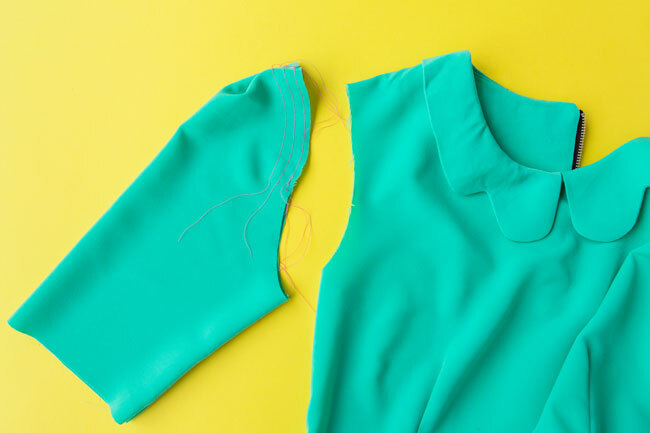 Finish the raw edge of each sleeve hem with zigzag stitch or an overlocker. Turn it under towards the inside by 20mm (3/4in), press and pin in place. 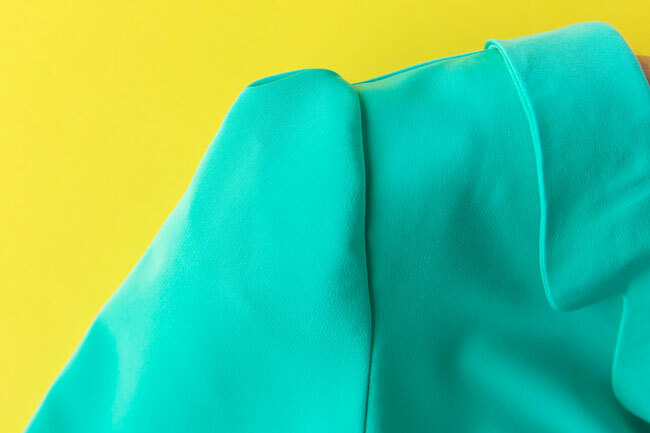 With the top turned right sides out so you’re sewing inside the loop of the sleeve, topstitch each sleeve hem close to the inside edge. And that’s it - you’ve sewn the sleeves! I hope you’re feeling suitably proud of yourself, my friend. Only one more step to go! Stay tuned for the final post of the Orla sewalong when we’ll finish the hem with a facing. 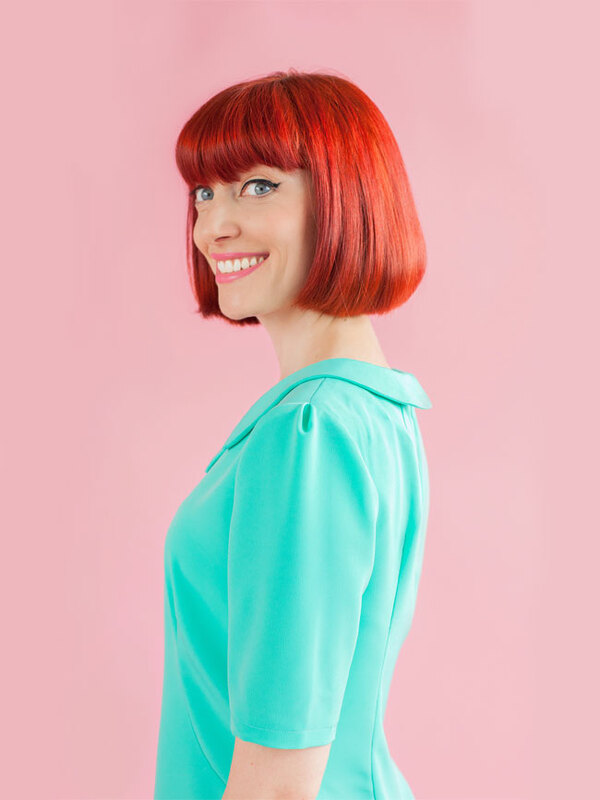 Ooh and then on 11 November 2015 we’ll be showcasing some of your Orla tops on this blog! If you want the chance to have your Orla top featured, email us a picture by 9am GMT on Monday 9 November 2015 at lookwhatImade [at] tillyandthebuttons.com. 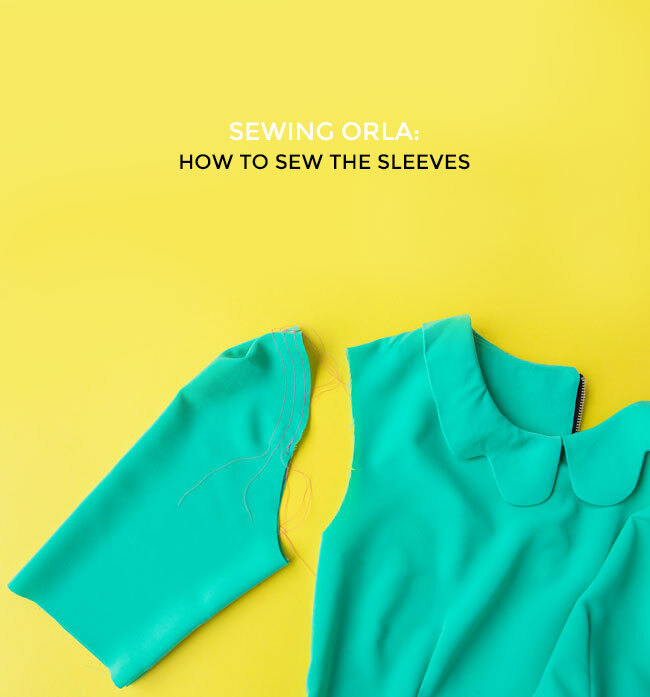 Alternatively if you want to post it on your own Instagram or Twitter feed, tag us in @TillyButtons and use the hashtag #SewingOrla so we can find it. We like to feature bright, focused, uncluttered images, at least 650px wide and preferably portrait format. Can’t wait to see what you’ve made!